Most paracord projects started out as survival and DIY tutorials. Since a parachute cord is such a resistant item, you should definitely have it around the house. Many easy DIY paracord projects can really help you out. Also, they are very versatile, ranging from survival kits and items to bracelets, necklaces and other types of accessories. Even more, there are even paracord projects for kids that your little ones will have fun with. You can learn how to make a cool paracord bracelet with just a few clips to keep them tied together. In fact, you can choose your own lock method, but this particular one is incredibly easy and will take you a matter of minutes. Even more, you can experiment with different paracord bracelet patterns. One of the more popular paracord uses is making a cool paracord keychain. It’s easy and practical, you can see all the steps here. Moreover, the durability of the parachute cord braiding will ensure that it will not snap and you end up losing your keys. In fact, you can use a glow in the dark paracord to ensure more visibility. Learning how to braid paracord can lead to some exciting projects. Moreover, a beautiful paracord necklace will take you a maximum of half an hour of weaving. In addition, it’s incredibly easy to make. Knowing how to tie a crown sinnet can come in handy for house projects. The beauty is that the sky is the limit. So, you can take advantage of the endless number of colors and patterns to create whatever you like. When it comes to DIY paracord projects, the friendship bracelet is one of the easiest tutorials out there. Even more, you can have your kid join in. Teach them how to braid paracord and open the way to new DIY possibilities. A paracord lanyard can prove very useful for various projects around the house. You can use a metal clip to ensure the same durability as the line itself, however, it’s still an easy project. Therefore, if you know how to handle paracord knots, you will have an easy time handling this tutorial. This is one of the most unique paracord ideas, it’s an entire project in itself. So, having this excellent DIY Paracord survival kit could definitely come in handy. Even more, it can show you how to create a lot of essential items with very little. With a paracord knife lanyard, you can make sure that your palm stays safe while handling a blade. In addition, by covering the metal, you will get a firmer grip and safer wielding. Some DIY paracord projects are just for the sake of making something fun and good looking. However, a glow in the dark paracord is more than just an interesting idea. It’s also practical and potentially useful for keeping track of your kid or your pet. You can make a paracord dog leash that will definitely stand the test of time. It’s an easy project that can ensure your pet will not break it no matter how strong they are. The paracord dog leash is definitely good for training days when teaching your dog not to wander off and risk injury. Making boot laces is one of the incredibly easy DIY paracord projects that could save you some time. In fact, this is something that every hiker should learn. It’s excellent for survival situations, as it will ensure you have a paracord with you always. Nothing beats spending warm summer days in a comfortable and durable paracord hammock. You can lounge with the assurance that it will not break or tear. In fact, a paracord hammock will stand the test of time with little investment. You can also browse through these DIY yarn projects for more cool stuff to do on your own. A paracord gun sling will ensure the safety of your weapon. You can make it with ease. In addition, you can adjust its length. Whether you are using a rifle or a gun, a paracord gun sling is guaranteed to last. Another exciting paracord idea is making a jump rope for yourself or even for your kid, this tutorial will help you make it. It might be a little tricky to make, but it’s well worth it. Also, you will learn more about paracord braids and patterns. Finally, last on our DIY paracord projects suggestions is this paracord bracelet made with LEDs. You will end up with a beautiful accessory to wear. Even more, the paracord braids will definitely last longer than any battery. 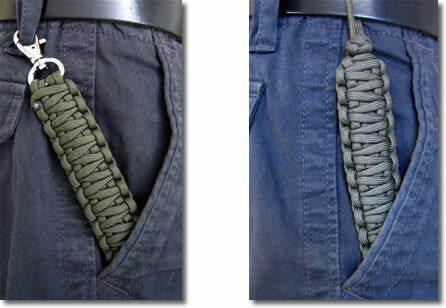 DIY Paracord projects keep getting better and better, not being limited to survival kits only. You can have some fine accessories from bracelets to necklaces just by following some easy DIY tutorials and guides. And the good thing about paracord items is that they last longer than any other materials you might be using. Even more, you can add them to the list of DIY gifts for your friends.